The herbalife rebuild endurance shake is an ideal post-workout muscle building drink designed for aerobic athletes. Why and When herbalife rebuild endurance ? It’s a post-workout shake specifically designed for aerobic athletes to get better exercise and competition results. Contains exactly the right ingredients to help with faster recovery and building muscles. Cross country, fun run or marathon participants. Long distance or steep incline cyclists. Anyone performing long distance or long duration aerobic exercise. Contains 36g of the quick release carbohydrate Maltodextrin to quickly replace muscle Glycogen stores; the faster these stores are refilled, the faster recovery will occur. Contains a 10g blend of fast and slow release protein from whey and casein to give you immediate and sustained support for your lean muscle mass, facilitating growth, repair and recovery. Contains L-Glutamine to support the immune system which becomes stressed during exercise and L-Carnatine which supports muscle metabolism and recovery. Taking herbalife rebuild endurance within 30 minutes after bouts of aerobic exercise facilitates muscle growth and recovery, significantly reducing muscle breakdown and therefore reducing pain and cramps associated with higher demands being placed on muscles. 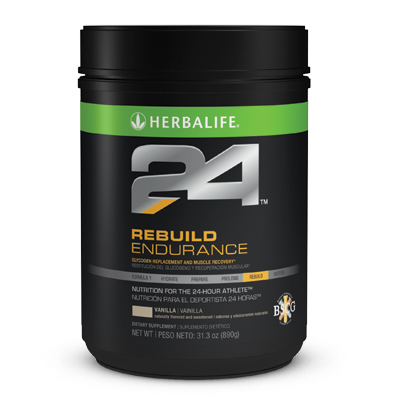 Mix 4 level scoops of herbalife rebuild endurance (50 g) with 250 ml of water. Shake vigorously. Consume within 30 minutes following aerobic activity. .